A Day night football match was played at bous higher secondary school ground kupwara.After a long fight to resist and claim the maiden day night Grand Finale Title, Beating different and teams in the tournament and finally Langate Sports and Lalpora 11 claimed to the Grand finale.The tournament compraised of 32 teams, From 32 teams 4 teams qualified for semifinals From semi finals round 11 star lalpora defeated khushal sports sopore and langate sports defeated subroto in a breath taking plenty shootout.Finally Lalpora take on langate in Grand finale of the Day night Football Match. The Match was won by Langate sports By beating Lalpora 11 by 2-0. The match was witnessed by thousands of spectators from disntinct parts of the district Kupwara. Member Of Parliament Fayaz Ahmad Mir, SSP Kupwara Shamsheer Hussain , Principal Boys Higher Secondary Iqbal Wani , DYSP Headquarters Fayaz Geelani and Senior Footballers and local guests were,Mohammad Sultan Malik, Ab Rashid Malik,Ab Khaliq Malik , Gh Qadir Malik ,Sanuallah Malik ,Mohammad Sikandar Malik, Ab khaliq Malik and Khazer Mohammad Malik. While talking to the winners team capitan he told that,We are very thankfull to Kupwara Sports Foundation that they came up to their words and finally made it possible with such a great atmosphere,such a epic and Thrilling Grand finale and we (Langate sports) owned the maiden Day night Title in kupwara. Runner-up Team capitan told that we are much thankfull to the Kupwara Sports foundation for giving us such great platforms to perform and losing the match don't deceive us and we will try our best next time. Refree of the Grand Finale were Bashir Ahmad Malik, Assistant Referee Md Amin Malik and Ali Mohammad sheikh. At about 100 volunteer were present in the game for the smooth and normal Ethical football game. More than 25000 Tickets were sold. Talking on This Occasion MP Fayaz Ahmad Mir Hold a golden heart by donating A Football Terp,Lighting sytem to be installed within 1 month, Fancing for the ground and 1 Room in Hr Sec School for Kupwara For Kupwara Sports Foundation. 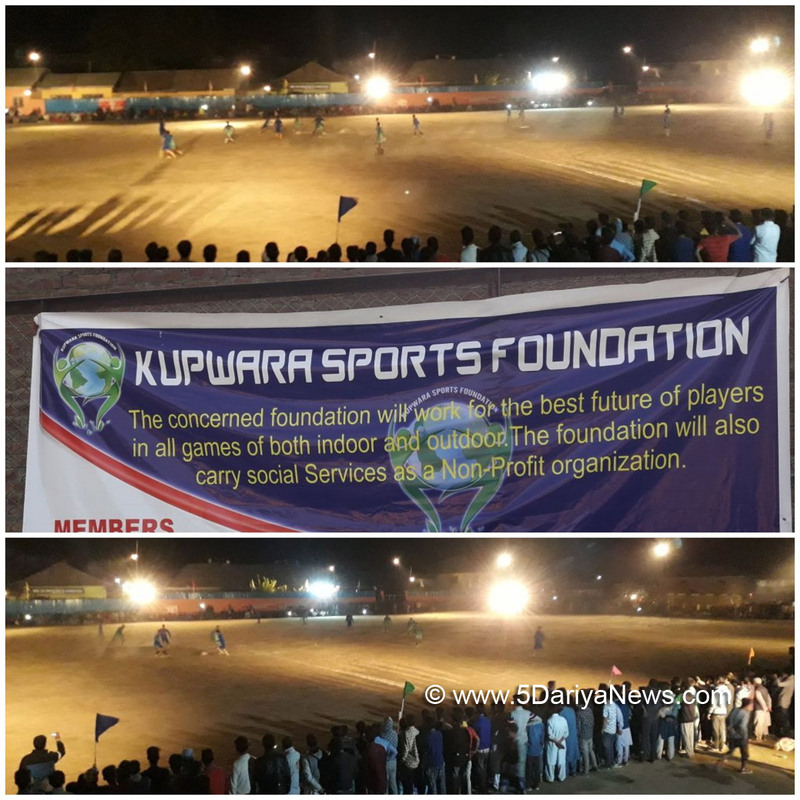 Kupwara sports foundation thanked all the volunteers and specially all the VIP guests presnet on this occasion and told that we will organise more tournammets in future that will atract more and more sports lovers.